Every month the ovaries produce an egg. This egg is then released into the fallopian tube in order to be fertilized. Once it is fertilized it implants itself in the lining of the uterus. That happens in normal pregnancy. However, in ectopic pregnancy the fertilized egg implants itself somewhere else. 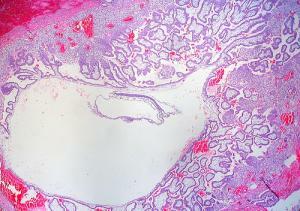 In the majority of cases, the ectopic pregnancy occurs in the fallopian tube. The fallopian tubes have the role to carry eggs from the ovaries to the uterus. When the ectopic pregnancy occurs in a fallopian tube, it is called tubal pregnancy. However, an ectopic pregnancy can also occur in the cervix, ovary or in the abdomen. In this type of pregnancy, the fertilized egg cannot survive. Since the tissue that tends to grow may affect many maternal structures, this condition should be treated immediately when discovered in order to preserve the chance for future healthy pregnancies. There are several causes that may be responsible for the occurrence of ectopic pregnancy. Previous fallopian tube surgery and previous history of the tubal pregnancy, as well as many fallopian tube disorders, influence the incidence of this type of pregnancy. Gonorrhea, chlamydia and pelvic inflammatory disease are three common infections that can occur in fallopian tube and cause the ectopic pregnancy. Furthermore, the use of certain medications and of intrauterine devices may also be potential causes for this condition. An ectopic pregnancy may also result from cysts in the tubes, endometritis and uterine fibroids. In the majority of cases, when a woman develops an ectopic pregnancy, in the beginning, she has the same symptoms that appear when a normal pregnancy is in the question. She may have missed periods, breast swelling and tenderness, as well as morning sickness and vomiting. However, since it is not a normal pregnancy, after a while she can notice certain symptoms that are not normal. These early symptoms of an ectopic pregnancy usually include pain in the lower back and pain in the lower abdomen or pelvis, as well as abnormal vaginal bleeding. Furthermore, rapid heart beats and hypotension, or low blood pressure, may occur due to the vaginal bleeding. This vaginal bleeding is caused by the hormonal changes and hormonal imbalance. In case when the fallopian tube ruptures due to the ectopic pregnancy, the woman may experience sharp and intense pain in the pelvis, as well as in the shoulders. It is accompanied by faintness, dizziness, sweating and excessive vaginal bleeding, which is very serious since it can lead to shock. I am going crazy because i have no real answers. will i lose my baby.